The shoulder is the most mobile joint in the human body. The shoulder joint is formed by the upper arm (humerus) and the shoulder socket (Glenoid). Total shoulder arthroplasty replaces both components of the "ball and socket" joint. 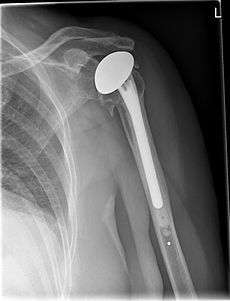 As is usual in joint replacement surgery, the ball at the humeral head is replaced by a metal device. The socket component is replaced by a smooth plastic device which replicates the function of the natural cartilage surface. When is a shoulder prosthesis required? Shoulder replacement surgery is required when the shoulder joint is de stabilised to the extent that the arm can no longer be used without pain. This lack of pain free mobility in the joint, may be due to osteoarthritis, or following traumatic injury to the shoulder. Implantation of a shoulder endoprosthesis is necessary if the wear or damage to the shoulder joint is so advanced, that non-operative and/or joint-preserving operations do not solve the problem. This is often found in cases of advanced arthritis of the shoulder joint (osteoarthritis) where the wear on the articular cartilage surfaces (primary osteoarthritis) is particularly painful and movement has become extremely restrictive. Furthermore, severe fractures or injuries to the upper arm (humerus (glenoid fracture), changes in the blood flow to the humeral head (necrosis of the humeral head), rheumatic diseases (chronic polyarthritis), instability (chronic shoulder dislocation), or severe joint infection (omarthritis), lead to the damage and wear of the articular surfaces (Secondary osteoarthritis). How do we achieve excellent results in shoulder arthroplasty? Arthroscopic surgery requiring only small incisions, resulting in faster recovery time and less pain. What factors enable our clinic to provide excellent results in shoulder replacement surgery? One of the preconditions for a successful outcome, is excellent diagnostics and imaging facilities. The Gelenk-Klinik Orthopaedic Hospital provides the most advanced and high resolution facilities, from ultrasound and digitally enhanced X-ray, to sophisticated MRI imaging. The radiology department is headed up by an extremely experienced radiologist. Data is expertly interpreted by a dedicated shoulder specialist. Any diagnosis made is backed up by accurate data and based on these findings, the patient is advised on the most suitable method of treatment. Total shoulder replacement or total shoulder arthroplasty. The stem of the shoulder prosthesis can be fixed by cement, or fixed as an ingrown prosthesis. The socket component (glenoid) is made of soft but durable plastic material. © Gelenk-Klinik Our dedicated shoulder specialist is able to offer the whole range of modern shoulder procedures. This enables the patient to receive a therapy individually tailored to match his particular needs. The quality and durability of shoulder replacement surgery is dependant on the expertise of the specialist in the operating room. The in depth training and experience of the Gelenk Klinik shoulder specialist, provides a foundation for successful and reliable outcomes in shoulder replacement surgery. The closed air circuit helmet system, with laminar airflow technology, ensures a safe and hygienic environment in the operating room. In shoulder replacement surgery, the shoulder joint, is replaced by an artificial joint prosthesis. The primary objective of this operation, is the reduction of pain in the affected shoulder. As the normal function of the shoulder joint requires freedom of movement (mobility), maximum mobility of the shoulder will be regained along side pain relief. 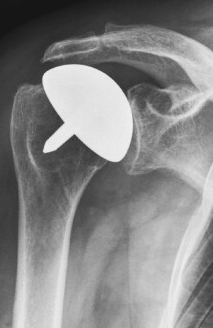 Hemiarthroplasty or "Shoulder Cap Prosthesis"
Hemiarthroplasty replaces only the articular surface of the humeral head. The bone of the humeral head is not removed. This prosthesis model is suitable in cases where the stabilising muscles of the shoulder joint (rotator cuff) are intact, or only slightly damaged, and the shoulder socket (glenoid) shows hardly any sign of wear. 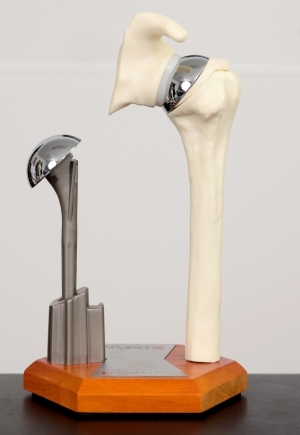 With this type of shoulder prosthesis, the shoulder joint is repaired by fitting a metallic surface to the humeral head at the top of the humerus. The cartilage at the surface of the joint socket (glenoid) remains intact. The hemiarthroplasty of the shoulder has the potential to preserve the still intact or unworn surface of the joint. One of the main problems in shoulder hemiarthroplasty is the continuing wear over time on the glenoid surface. Pain may increase and mobility and weightbearing ability decline, if the glenoid component wears out prematurely. The average improvement of range of motion in all directions after shoulder hemiarthroplasty is more than 40°. This clinical result is similar to the results in total shoulder arthroplasty. In order to recommend hemiarthroplasty, the shoulder specialist needs to thoroughly evaluate the glenoid surface and be satisfied that it is in good enough condition to ensure a successful outcome for the patient. The reason why hemiarthroplasty is considered to be a desirable option if it is at all possible, is that it preserves the natural bone surface and bone stock of the shoulder. Under these circumstances, if in the future secondary surgery needs to be performed, the outcome would be superior to revision surgery of a total shoulder arthroplasty. Total shoulder replacement or total shoulder arthroplasty. The humeral component is fixed within the upper arm. The glenoid is replaced within the joint socket. © Wikipedia Total shoulder arthroplasty replaces both components of the shoulder joint: the humeral head and the glenoid socket. 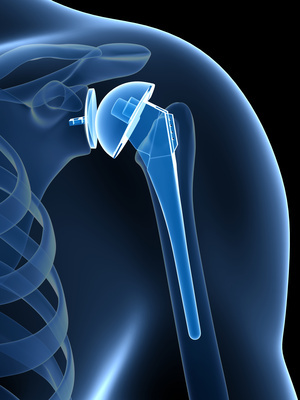 It is the most widely used type of shoulder replacement. If both joint surfaces, humeral head and glenoid are worn out a total endoprosthesis is necessary. By this method of the replacement, the portion of the humeral head closest to the joint is removed. Next, the inside (marrow space) of the upper arm bone is prepared for the stem of the prosthesis. A prosthetic stem is implanted within the bone. One of the most severe complications of a total shoulder prosthesis, is the loosening of the glenoid component. This results in new pain and reduced mobility. Thorough diagnosis and perfect sizing and fitting of the prosthetic components is therefore an essential aspect of shoulder surgery. Possible complications such as osteoprosis (reduced bone quality) need to be carefully evaluated by the shoulder specialist. Reverse shoulder prosthesis, where the positions of the ball and socket joint are reversed so that the socket joint is at the top of the humerous. This arrangement has some unique mechanical advantages for people who, as a result of massive rotator cuff tears, have lost the normal mechanics of their shoulder. This often occurs in patients with arthritis and is used only if the rotator cuff is severly damaged and no longer functional. In the case of rotator cuff damage, the normal mobility and usage of the muscles to drive shoulder movement is reduced. The reverse prosthesis will be able to restore some of the shoulder function and also reduces the constant pain and wear that is caused by untreated shoulder osteoarthritis. Total shoulder arthroplasty is a very successful method of shoulder surgery. After shoulder replacement, both function and the ability for weightbearing and mobility of the joint, are no different from that of a normal shoulder, as long as the muscles and rotator cuff were still largely intact before surgery. The success rate for shoulder arthroplasty at the Gelenk Klinik is very high, with a patient satisfaction rate of more than 95%. 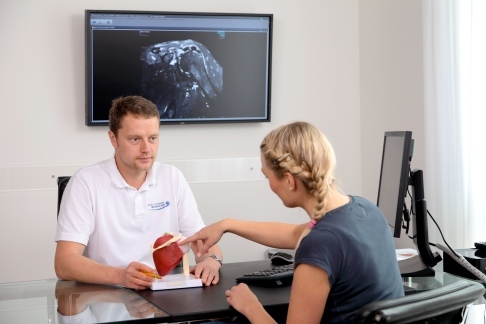 The high degree of specialisation of our dedicated shoulder experts provides the routine and experience required for thorough diagnosis and successful outcome of shoulder replacement surgery. How to prepare for your shoulder replacement surgery? The patient should be in a good physical health at the time of the procedure. This prevents postoperative complications. One of the most severe complications would be an infection of the prosthesis. For this reason any sign of infection in your body needs to be reported prior to surgery and evaluated. This precaution extends to any kind of heart, lung, kidney, bladder, tooth, or gum problems. Any kind of underlying health problem should be managed before an appointment for shoulder surgery is arranged. Any infection which is noticed between the time that the surgical appointment is made and the date of the operation must be reported, as it may be a reason to delay the procedure. In addition any severe skin problems should be resolved before your shoulder replacement surgery. Please make your shoulder specialist aware of all health issues as well as any regular medication you are taking before your surgical appointment. Some of your regular medication may have to be modified. For six weeks after surgery the focus will be on exercise to maintain the passive range of motion in the joint, until the surgical procedure is completely healed. This is particularly important in the case of shoulder surgery, as the shoulder is the joint most likely to loose it's range of motion without specific exercise. Only after six weeks when the bones, tendons, muscles and skin have properly healed, will you exercise to build up your strength. This is the moment when you can gradually return to your daily routine. Moderate sports and gentle activities can be started as well, but only with the advice of your shoulder specialist. You may follow a rehabilitation regime by yourself or working with a physiotherapist. When will it be possible to fully resume daily activities? After you have worked on mobility and strength you can expect to be fully able to take part in all normal daily activities after twelve to twenty four weeks. This typically includes all work related activities, swimming, golf cycling and other low impact sports. As with all types of prosthesis or joint replacement surgery, higher impact related activities should be avoided for as long as possible. In which cases is shoulder replacement surgery no longer possible? Shoulder prosthesis requires sufficiently stable bone surfaces of the shoulder joint. If these surfaces, as a result of bone death (osteonecrosis) or osteoporosis are no longer stable, shoulder prosthesis surgery is no longer recommended as the outcome will be unreliable. Underlying infection is also a contraindication to the successful outcome of shoulder prosthesis surgery. Microbiological pathogens can be deposited on the artificial surfaces of the prosthesis, as a result bacterial infections are in general one of the most severe contraindications to shoulder prosthesis. It is not until infection has been completely eradicated from the body, that prosthetic therapy for shoulder osteoarthritis can be considered. There are surgical alternatives to shoulder replacement, which are mentioned here briefly for completeness. However in recent times these have been greatly reduced in importance, in comparison to the reliable and medically successful shoulder prosthesis operations. At this point in time, shoulder fusion surgery is only considered if the rotator cuff muscles are neurologically paralysed. It can also play a role where there is chronic infection. As a primary therapy for shoulder arthritis, shoulder prosthesis now has precedence over shoulder fusion. Hemiarthroplasty for the analgesic treatment of shoulder joints with strong osteoarthritis, has also greatly lost importance due to the successful development of shoulder prostheses. By this method, the arthritic humeral head (humeral head) is amputated. This process is now only relevant almost exclusively after infection or as a secondary procedure where prosthetic shoulder replacement has failed. Mrs. D. S. (47), Canada, foot and ankle patient: " I never imagined that I would be able to walk barefoot again on river stone "
Mr. C. (60), Australia, knee patient: "I would highly recommend the staff at Gelenk Klinic. I would recommend the clinic to anyone." Mr. S. (28), Romania, ankle patient: "What impressed me, was the high experience of the surgeons"
Mr. A, (78), Egypt, knee patient: "Didn’t seek other offers as it was highly recommended by a friend." Mr. J, (84), Netherlands, knee patient: "Quality, friendlyness, attention for patients and good information"
Mr. C. (39), Mexico, knee patient: "Mrs Ponert helped us with all the travel arrangements"
Mrs. P. (49), France, foot and ankle patient: "Thanks to Gelenk-Klinik I can do sports again: I'm grateful to it and can say that I was lucky enough to find it. " Mr. H. (44), Egypt, knee and spine patient: "The clinic to me is a comfort zone where I feel pure professionalism and experienced specialists"
Mrs. V. (68), Australia, knee patient: "The multilingual doctors each are specialized in various areas and I have been very impressed by their expertise"
Mr. W. (43), Brazil, knee patient: "They are all really concerned on understand your symptoms and treat them the best and most safe way possible." This site complies with the HONcode standard for trustworthy health information:. verify here. Gelenk-Klinik Gundelfingen is DIN ISO 9001:2015 certified.